Welcome to the community of Broadmoor. We hope you will enjoy living here. We would like to take this opportunity to introduce ourselves to you. As your police department, established on December 21, 1948, we provide a full range of services from criminal investigations to responding on medical emergencies, as well as residential vacation security checks that are rare in police services today. We are a community and family oriented Department. (Your police services are provided by the only operational Police Protection District in the State of California. 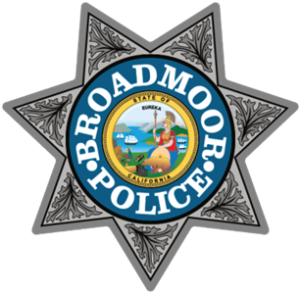 Broadmoor is a small township located in San Mateo County with a geographic area of approximately 2 ½ square miles and a population near 7000 people. 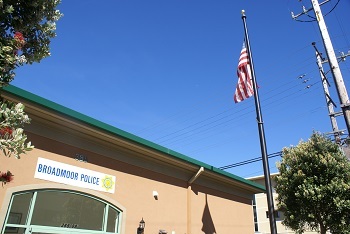 Relative to community safety, Broadmoor was the second safest community in San Mateo County in 2000 according to the California Department of Justice. However, we must all work together in continuing and improving this enviable position. We encourage you to be cognizant of strangers, lock your home and automobiles, and be generally aware of what occurs in your neighborhood. Your fire services are provided by the award winning Colma Fire District which serves Broadmoor as well as the Town of Colma. Your Fire Department also responds to fire and medical emergencies, and provides other services to our community. In the event you have any questions about the community and its services, please do not hesitate to call or contact us. Feel free to also ask a patrol officer for assistance, or stop by the station which is located at 388 – Eighty – Eighth Street Street.